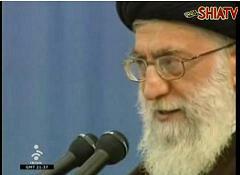 Vali Amr Muslimeen Ayatullah Sayyed Ali Khamenei delivered this speech on the occasion of New Year 1390. Vali Amr Muslimeen, Ayatullah Sayyed Ali Khamenei calls for unity and brotherhood between the Shia & Sunni brothers around the world. The leader emphasized that this is a plot sketched by the enemies of Islam and Muslims. The enemy is actively taking measures to create enimosity between Shia and Sunni. The time is that we unite against the common enemies and not let them take advantage of our differences. Vali Amr Muslimeen Ayatullah Sayyed Ali Khamenei highlighting the fate of Western philosophies and ideologies. Beware O believers! It is a war between global Zionist system and global Islamic system. May Imam Al-Mahdi (a.t.f.s) reappear soon to establish the full Islamic system on earth. Vali Amr Muslimeen Ayatullah Sayyed Ali Khamenei lead the Eid-ul-Fitr Salaat in Tehran on 19 August 2012. Vali Amr Muslimeen Ayatullah Sayyed Ali Khamenei lead the Eid-ul-Fitr Salaat and delivered the Khutba in Tehran on 19 August 2012.